The Quandis Military Search (QMS) data service provides a cost effective, all-in-one verification of active duty military status of an individual with the US Department of Defense (DoD) as defined by the Servicemembers Civil Relief Act of 2003 (SCRA). If your company needs up-to-the-second information on active duty status of your customer, QMS can automate your searches, returning raw data as well as PDFs. * This estimate is based on frequent 100,000-row data files requesting images be returned with the raw data. Data-only results may be returned in a matter of minutes. If any one of those permutations turns out to be on active duty, QMS will flag your customer as being on active duty. Additionally, QMS will return to you the details of each permutation we searched, keeping you as informed as possible and allowing you to stay in compliance. Additional information can be found on our Name Parsing and Name Permutations page. Create numerous PDF packages while applying different settings to each one. Eliminate FTE in post-processing by letting QMS take care of the busy work. Render unique packages for internal and external purposes in order to maximize compliance. Set up versions with or without Screenshots, Summary Reports, or NPI Redaction by leveraging a host of QMS options. If you don’t have social security numbers for some of your customers, QMS can look up the SSNs automatically prior to submitting the request to the DoD. When performing a SSN lookup, we search public records by name and address. This often returns more than one possible “hit”. QMS will search each hit returned by the SSN lookup, so you cover all your bases. If any one of those “hits” turns out to be on active duty, QMS will flag your customer as being on active duty. Additionally, QMS will return to you the details of each “hit” we searched, so you can decide if the hit was in fact your customer. Most customization can occur without additional cost or impacting timelines. *Permutation logic needs to be assessed on a per requirement basis. We offer several standard permutations features that covers industry compliance requirements. Of course, we provide a dashboard with detailed search capabilities, so you always have the option of reporting on all or any subset of your customers you wish, on demand. Compliance package: ideal for attorneys and other organizations which need to verifiy active duty status and prove to third parties (auditors, courts, etc.) that they did so with a complete audit trail of screen shots and certificates. Verification package: ideal for banks and other organizations that need to verify active duty status in order to drive their internal processes correctly. Custom packages: for very large volumes, or for organizations that need to mix-and-match QMS features on an à la carte basis. * SSN Locator searches cost $1.00. Price includes all aliases searched. Monitoring changes cost $1.00 per change. Monitoring: provide QMS with a portfolio of names, and we’ll check their status on a recurring basis, notifying you of changes in status. If you need to mix-and-match our various features, or or you need manage very large volumes, we’re happy to create a custom package for you at a custom price point. Feel free to give us a call @ 949.525.9005 or drop us an email. Real-time search: uses DMDC Single Search for fastest turn-time. What information do I need to provide for a search? What are the various statuses of a search? What do they mean? There are 5 possible statues: Active Duty, Discharged, Not Found, Unable To Process and Undetermined. 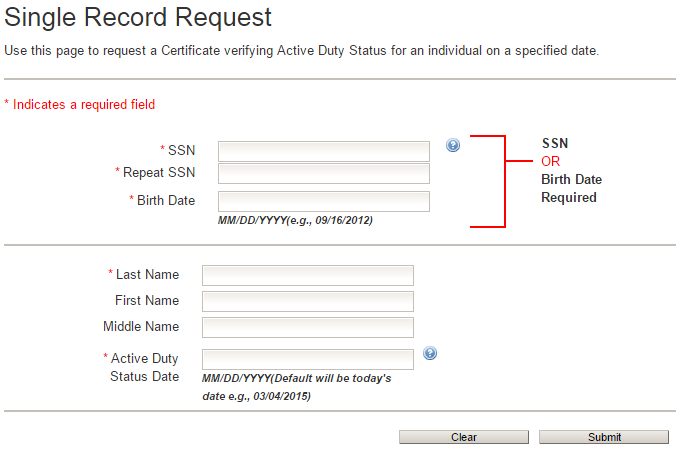 Active Duty – Indicates Active Duty information was located based on SSN or birth date and last name. This is considered a match. Discharged – Indicates Active Duty information was located based on SSN or birth date and last name. The contact shows a discharge date. 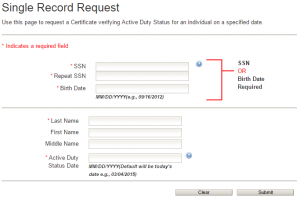 Not Found – Indicates SCRA has no information based on SSN or birth date and last name. This is considered a no hit. Unable To Process – Indicates an error was encountered when searching SSN or birth date and last name. SCRA generally returns this error when the SSN appears to be in a fictitious pattern such as 999999999 or 111111111. In a very small percentage of cases the SCRA will return this status with what appears to be a valid SSN and last name. Undetermined – Multiple individuals located with the same last name which share the same birth date. Generally speaking, this type of match requires further investigation. What are the various service branches returned by the search? The branches can optionally be condensed to Air Force, Army, Coast Guard, Marine Corps, Navy, NOAA, Public Health Service for simplicity. How can QMS prove they submitted our exact data to the DOD? One can easily bring up the DoD website, key in data, and print the page. This does not mean that the user actually clicks on the “Lookup” button. As a result, this “proof” can be easily fabricated. “Web pages” are HTML rendered by a browser generally geared for human eyes. It does nice things like prompt people to enter the correct data fields, and provide a Lookup button to tell the browser to transmit data back to the SCRA servers. When a user clicks on the “Lookup” button, the user’s browser just transmits the data fields to the SCRA servers. Quandis’ technology just transmits the data fields to the SCRA servers, without ever requesting the HTML page that prompts users to enter data fields. Not only is such a page useless to the automation software, requesting the HTML from the SCRA website with every search would actually slow the search down. Proof of submission means proof that the SCRA website actually received the data Quandis claims to have submitted. The DoD recognizes the need to provide an audit trail in case questions arise about the validity of data in the future. To solve this, DoD provides a ReportID, which is a unique identifier that can be used to reconcile with the DoD at a future date. The ReportID cannot be faked, and is proof both that Quandis submitted the data, and that the SCRA website received the data. Should a court require that a bank “prove” the DoD listed a service member as active (or not), one must simply contact the DoD with the ReportID, and the DoD can provide the data that was submitted. This is the only fool-proof audit trail. We have our own XML formats we use. Can QMS adopt these XML formats? Yes. QMS can transform our native QBO formatted data into your organization’s format. This is extra effort and will impact the implementation timeline. We already expose various end points to accept data. Can QMS tap into these endpoints? if the current endpoint is not supported by QMS standard protocols then a custom component will need to be built. Your current endpoint may require a certain XML format to correctly function. When QMS connects to a custom endpoint, we generally transform the data from our standard format to the required endpoint format. This is extra effort and will impact the implementation timeline. Is data delivered to QMS in a secure manner? Yes. Our web based API utilizes HTTPS. Clients can also transmit batch orders as Excel files with PKI and/or transmitted securely via sFTP or FTPS. Once on the Quandis network, the request files are processed and individual borrower names and SSNs are stored in a secure SQL Server (with SSNs being symmetrically encrypted at rest). Data is transmitted between QMS and the SCRA website over HTTPS. Are results received from QMS in a secure manner? Yes, result files are built on the QMS platform, and may be encrypted with PKI and/or transmitted securely via sFTP, FTPS or HTTPS to the client. We can email clients with a secure hyperlink to download the result file. Each search includes a PDF document containing the image of the SCRA website results. Neither this image nor the aggregate results file contain SSNs, though they usually contain borrower information and loan numbers, so continue to be treated securely. QMS is a completely automated platform; Quandis employees are not involved with the mechanics of a military search. Quandis system administrators have access to the servers on which the data is processed, and are governed by our Security Policy and Procedures document. The request and result files are encrypted and/or transmitted via secure channels (sFTP, FTPS, or HTTPS). All data within QMS is stored in a secure SQL Server database, with SSNs being encrypted at rest. SQL backups are encrypted, and stored on RAID media in our alternate production data center. RAID media is physically destroyed upon disposal. We do not use tape backups or off-site storage of our backups. All access to RAID media is tightly controlled with a minimum of two-factor authentication, and employees with access are trained in accordance with our Security Policy and Procedures document. Quandis maintains multiple SSAE-16 certified data centers. Our Military Search primary hosting location in our CA data center, with nightly backups transmitted to an alternate data center. Load balanced web and application servers integrate with SQL Server 2008 for back end data storage. The limiting factor in volume is the DoD’s SCRA website. We typically process 10K orders per hour in our near real-time channel and support DoD batch volume.